We believe that every child should be given the freedom to encounter something fascinating every day. 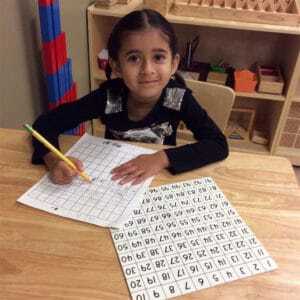 Our Montessori Preschool Programs encourage self-discovery in a fun and engaging environment. Our Toddler class ranges in age from 18 months to 24 months. At this stage, toddlers learn through sensorial exploration. They want to see, touch, hear, taste and smell everything! We provide learning opportunities both inside and outside the classroom. 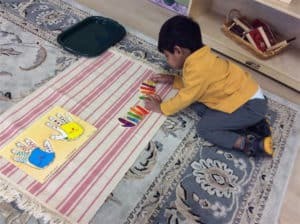 Villa Montessori Preschool Toddler classrooms offer extensive outlets for exploration in varied media such as painting, sculpting, light table discovery opportunities, music and movement, gardening and yoga. The Toddler environment is set up in such a way as to promote investigation, creativity and experimentation. At this stage, toddlers are just acknowledging there are others in their environment and they begin to learn how to cooperate through play. Our Pre-Primary class ranges in age from 24-36+ months. At this age, children are challenged with trying to communicate their ideas and emotions. We give them the tools they need to navigate through this stage. Each child is treated as an individual, with their own ideas, expressions, and opinions. We provide outlets that represent the child’s many “languages.” These can include drawing, painting, sculpture, shadow play, dramatic play, scientific observations, gardening and music. We strive to know the child and develop the emergent curriculum to support their personalities. Our Primary class is a mixed age group ranging from 3 years to 6 years. Our program recognizes that children learn best by their own experiences. We offer a hands-on learning environment, rich with materials designed to engage their imaginations. It is important to us that our students focus on the process of learning, not the product. With this philosophy at the forefront of everything we do; education is not a rote memory exercise, it is a creative process. Often, we see true joy in learning from the child’s perspective. Our Montessori preschool programs emphasize critical thinking, problem solving and productivity, along with social and emotional growth.